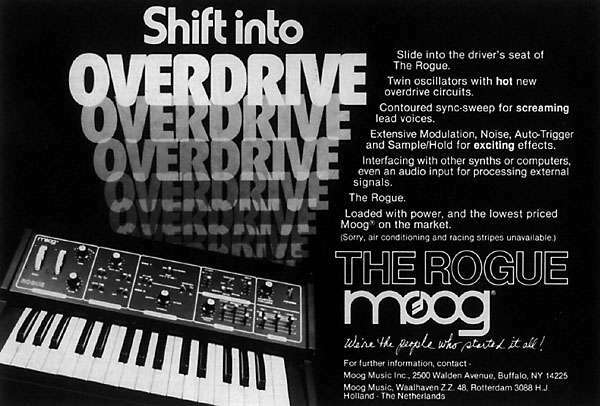 The following plans describe a method of adding MIDI capability to the popular and affordable Moog Rogue analog synthesizer with the Synhouse MIDIJACK. The Rogue is especially well suited for this modification due to the tiny size of the MIDIJACK circuit board and the fact that it is the first analog MIDI retrofit ever made that costs less than the instrument itself! The original factory keyboard glide in the controllers section will still work with MIDI. Some drilling is required to do the cleanest possible installation, unless the user prefers to mount the DIN jack to the plastic sides of the instrument. There is plenty of space on the Rogue to mount the MIDIJACK with the provided hardware. The micro size and black color of the MIDI button are such a perfect match for the Rogue that it makes it look as if it came from the factory with the MIDI interface. The installation of the MIDIJACK in an Rogue is one of the easiest modifications of all. In fact, with the MIDIJACK, it is possible to convert the Rogue to MIDI without even removing a single circuit board from the instrument! The correct analog I/O signals are easy to find and connect to the MIDIJACK. The whole MIDI conversion job can be done in one hour. The 1/4" jacks do not even need to be unscrewed from the back panel. They may be left in place and all solder connections made on the back of the circuit board holding the jacks. This modification reroutes the local keyboard signals through the computer-controlled analog switching matrix of the MIDIJACK by extracting the signal and inserting the users' choice of local keyboard control or MIDI. You can do this yourself if you have a little experience with electronic repair and the soldering of wires and circuit boards. If not, these plans may assist a professional repair shop installing the MIDIJACK for you. The particular installation on which this document is based was on Moog Rogue serial #8180, other revisions may be different. It is best to download these notes and photos and print them out on paper to look at while working on the instrument and make notes and check off the steps as you go. As with any project, it is best to completely read and understand each step of the instructions before starting. All repairs and modifications made to your instruments will be done at your own risk and Synhouse Multimedia Corporation assumes no liability for personal injury caused or damage to equipment or loss of use caused directly or indirectly by the use of these plans. If in doubt, don't do it! 1) Be sure to have the correct tools and supplies for for the job. If you do not have them, get them. You will need a regular size Phillips screwdriver, a smaller size Phillips screwdriver, needlenose pliers, wire cutters or other flush cut nippers, a hobby knife such as an X-Acto, scissors, a soldering iron, solder, electrical insulating tape, and a black Sharpie permanent ink marking pen. If you intend to mount the DIN jack on the back panel with the rest of the interface ports (highly recommended), you will need to use a chassis punch (a small hand tool that safely cuts a clean hole in a metal panel) to make the hole for the DIN jack, and an electric drill with a 3/32" or similar size drill bit to drill holes for the 4-40 hardware used to mount the DIN jack, and also a 1/4" or 5/16" drill bit to make a pilot hole to start the chassis punch. The correct size for mounting a MIDI DIN jack is 14.5 mm metric or 5/8" SAE (.62"/15.9 mm) in American sizes. A chassis punch may be purchased from any good tool or hardware store. If it is more convenient, a punch may be mail ordered via internet or telephone from Mouser Electronics at http://www.mouser.com or (800) 346-6873. The Mouser part number is 586-3803 for the name-brand Greenlee 730-5/8 (about $30). The cheaper house brand part number is 380-0145 (less than $20). The service from Mouser is unpredictable and the house brand ordered by Synhouse for the test installation took three months to be delivered, while the Greenlee part was delivered in one week. Mouser refused to give even a small discount to customers of Synhouse, so no recommendation is deserved or being made here, and any other source you know of to buy this type of tool is highly recommended and certainly a better place to buy from for all of your needs now and in the future. You will also need an 11 mm wrench (for Greenlee) or 1/2" wrench (for the Mouser house brand punch) or adjustable wrench to turn the chassis punch while cutting the hole. 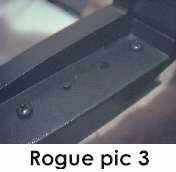 If you choose to mount the DIN jack in the soft plastic portion of the Rogue chassis, the X-Acto knife will carve out the hole quite easily, and will also make the holes for the screws as well, so no chassis punch, electric drill, or drill bits are needed for this alternate quick mounting method. 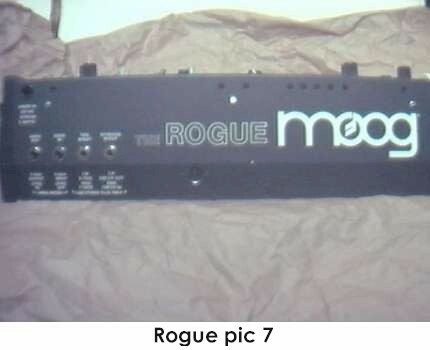 2) Fully test the Moog Rogue to be converted to MIDI. Be sure that all functions such as the envelope generator work and that the instrument plays in tune while playing along with a known well-tuned instrument such as a newer digital synthesizer or sampler keyboard. If it doesn't work properly without MIDI, it certainly won't work with it. 3) Extreme caution should be taken while working on the Moog Rogue. The unit should be unplugged while open and even then, the power supply may pose some electric shock hazard due to residual voltage in the power supply. Also note that the thin metal chassis has edges and corners that can be very sharp and rusty, so be careful not to cut yourself. 4) Remove the five Phillips screws that hold the upper and lower case halves together. Four are on the bottom panel, two on the right edge, two on the left, and one is on the rear panel at the lower edge in the center. Remove the two silver flathead screws from the front edge. 5) Open the case and turn the synthesizer upside down and shake out any dust and debris that may have accumulated inside the instrument over the years. 6) Determine the place where the MIDIJACK circuit board will be mounted and test fit the board into its' correct place inside the case. The best place to mount the MIDIJACK board is on one of the plastic panels to the left or right of the keyboard, on one of the little flat ledges that are 1" x 5", with the MIDI button towards the front and the scale adjust trimmer and the wires at the rear. When put in this location, the MIDI function button is easily accessable while playing. Mark the correct mounting holes on the panel with a pencil, marker, or needle using the paper drilling template provided with the MIDIJACK Installation Manual. The photo called Rogue pic 1 shows the paper drilling template in place. Do not use a high-speed drill to make the holes. This portion of the panel of the Rogue is made of soft plastic and a high-speed drill will build up friction, generate heat, and burn the plastic permanently. You may use a drill set to a slow speed. The perfect size drill bit for the switch stem and two screw holes is 9/64", and the perfect size for the scale adjust trimpot is 3/16". If your drill is not slow enough, you can use a standard X-Acto knife blade with a sharp point and twist it in place until it starts to dig a little hole. When it gets close to reaching the other side, you can look inside and see the tip coming through and dig back from the inside as well. A perfectly round hole can be shaped using this technique. A photo called Rogue pic 2 shows the location of the newly cut mounting holes. 7) Mount the MIDIJACK in place without fully tightening the screws and try to get the perfect size holes by twisting the X-Acto knife but do not make them too big. The switch should be fitted so well in the panel that the switch stem will not wiggle at all once in place. It should not have any free play but also should not be so tight that it binds. When the switch is pressed, it should have a definitive "click" and bounce back like the button on a new VCR. You will never regret spending too much time on this and good attention to detail will make the perfect MIDIJACK installation. The hole in the panel that is over the MIDIJACK scale adjust trimpot should be enlarged so a Synhouse Pocket Screwdriver can fit through the panel for periodic adjustment. The screws that secure the MIDIJACK board in place should be tightened very carefully. The panel is plastic so do not overtighten the screws. 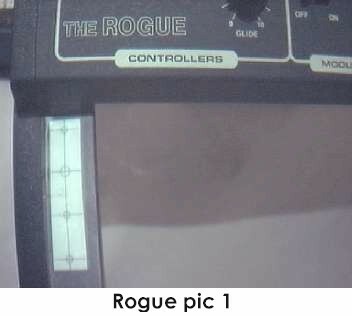 The perfect MIDI control panel installation is shown in Rogue pic 3. Such an installation will be nearly invisible, yet put the MIDI function button at the players' fingertips. For the serious Analog User and synthesizer collector, an ultra-clean installation pays off. 8) Determine the place that the MIDI input DIN jack will be mounted. 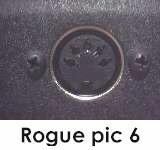 A good place to mount it is on the back panel below the "O" in Rogue, as photographed in this example. There is a lot of room on the rear panel of the Rogue, so you may mount the DIN jack wherever it suits you best. The way to make this look like original Moog factory equipment is to mount the DIN jack inside the metal panel after marking the bare metal edges of the hole with a black Sharpie permanent ink marking pen to match the black finish of the original metal chassis. Use the paper template to mark the correct spots to drill and cut as shown in Rogue pic 4. It is advisable to use a chassis punch to make the hole for the DIN jack. Remember that the DIN jack is to be mounted with the smaller 4-40 hardware size rather than the larger 6-32 size that secures the main board. Drill two holes for the screws then drill a slightly larger hole in the center to act as a pilot hole for the chassis punch. Use the chassis punch to cut the hole and be sure that the wrench is turning the tool from inside the Rogue, not outside, so the cutting edge is coming from the outside. This will ensure that the outer edge is perfectly smooth. 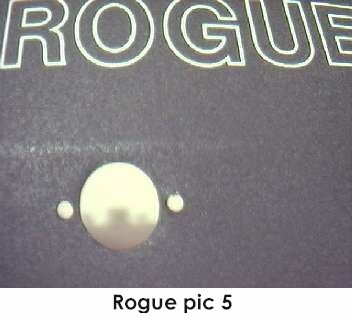 The properly cut mounting holes may be seen in Rogue pic 5. The MIDIJACK hardware packet contains both long and short 4-40 screws for the DIN jack. Use the two short ones for installation on a thin metal panel such as the Rogue. When all three holes are perfect, put the DIN jack in place inside the chassis and secure with the two screws from the outside, and the four split washers and two 4-40 nuts on the inside against the back of the DIN jack and tighten with a small Phillips screwdriver from the outside and the needlenose pliers from the inside. These should be very tight as they are going onto the metal surface of the DIN jack. 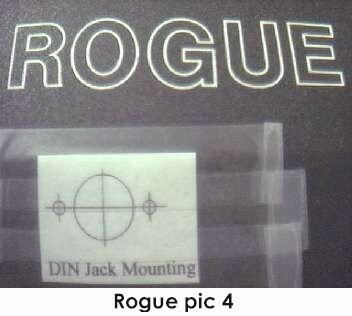 By using the Synhouse paper drilling template, a center punch to start the drill, and a chassis punch, your DIN jack mounting can look perfect like the one shown in Rogue pic 6. 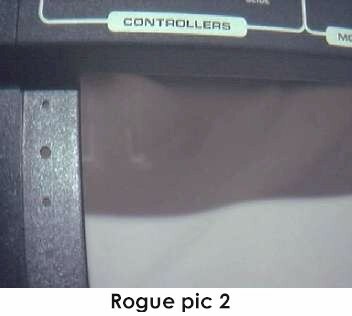 If done cleanly and correctly, the Rogue will look like it had MIDI when it came from the factory, as in Rogue pic 7. 9) The wonderful thing about installing the MIDIJACK in a Moog Rogue is that all six necessary wiring connections can be made to a single circuit board in the Rogue, on the rear side that is easily accessable and the entire modification can be performed without removing the board from the instrument. The Rogue has PC-mounted 1/4" jacks on a small board. 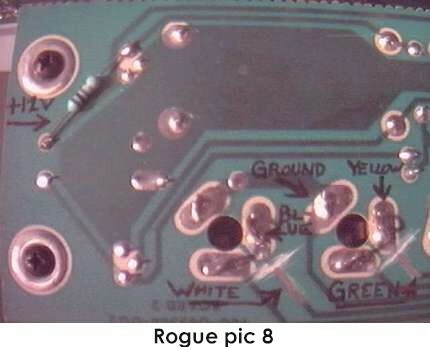 See the photo called Rogue pic 8 which shows the rear foil side of this board marked with a black marker to show the correct connection points for the easy color-coded MIDIJACK wires. 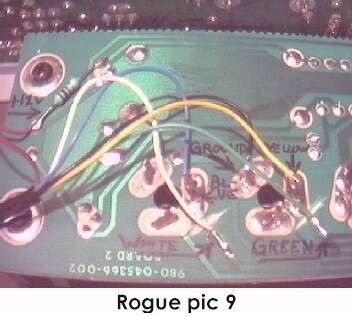 This photo also shows two razor-cut circuit traces, which appear white on the green board. Locate the two points which say "BLUE" and "YELLOW", and use an X-Acto knife to cut through the traces to break the standard circuit. After cutting through, use the edge of the blade to scrape the green varnish (soldermask) off a 1/4" section of the now-isolated trace, but not the half that is still connected to the terminal. Look carefully at the photo. The bare copper will be exposed. This will be your new solder pad for the wires which carry the CV/gate signals from the MIDIJACK and into the Rogue. This cutting isolates the terminals that connect to the ring of plugs inserted into the CV/gate jacks. These are the points where the CV and gate signals from the local analog keyboard and external CV/gate inputs pass on their way to the VCOs, VCF, and envelope generators. This is the point where the MIDIJACK will be inserted, "downstream" of the standard control, so the MIDIJACK can activate or deactivate itself at the users' command. Once the cutting is done, six wires must be connected next. 10) The MIDIJACK #1 black and #2 red wires must be soldered in place to get the ground and power for the MIDIJACK. There is ground terminal on each of the 1/4'' jacks, and one is marked "GROUND" in the photo. Solder the MIDIJACK #1 black wire to this point. The correct regulated +12v power is available on one lead of a resistor on the back of this board, as marked "+12V" in the photo. Solder the MIDIJACK #2 red wire to this point. 11) Solder the MIDIJACK #3 blue wire to the newly isolated CV terminal marked "BL-UE" in the photo. 12) Solder the MIDIJACK #4 white wire to the bare copper trace marked "WHITE" in the photo. 13) Moog synthesizers generally do not disconnect the keyboard from the trigger circuit with a switched jack as they should. For this reason, the local keyboard will still trigger the envelope generator even with the MIDI activated. The Rogue is no exception. The Moog S-Trigger method of interfacing is far inferior to the normal positive voltage gate signals found in nearly any other brand (also known as V-gate, V-trigger, or V-trig). The MIDIJACK always performs better when installed as a V-trig gate. In most Moogs, it is best to convert the Moog input to a V-trig type with a transistor and resistor. In the case of the Rogue, there is already a V-trig input (marked V-GATE on the panel) so you can do the MIDIJACK installation as if it were a Pro-One or SH-101. For this particular installation, disregard what the MIDIJACK Quick Installation Manual says about the general installation in Moog synthesizers. This one will be better. 14) Solder the MIDIJACK #5 yellow wire to the newly isolated gate terminal marked "YELLOW" on the photo. 15) Solder the MIDIJACK #6 green wire to the bare copper trace marked "GREEN" in the photo. 16) Photo Rogue pic 9 shows the rear of the jackpanel circuit board with the MIDIJACK board already connected to the proper points. A look at this will give some idea of what it will look like when done correctly. 17) The MIDIJACK #7 brown wire may be cut off at this time because it is not needed for this installation. Connection of the MIDIJACK #8 violet wire is optional. It may be used for a special function as described in the Advanced Installation Manual or cut off at this time. It is not needed for adding MIDI to the Rogue. 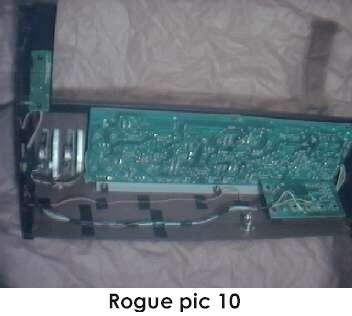 18) Now that all connections have been made, the inside of the Rogue should look as shown in Rogue pic 10. It is a good idea to cut short pieces of electrical insulating tape and use them to secure the MIDIJACK wires to the inside of the chassis so they will not rattle and break loose inside the case once the instrument is returned to service. The MIDIJACK hardware packet contains nylon cable ties which can be used to tie the MIDIJACK wires into little bundles before taping in place. 19) Carefully examine all soldered connections for possible short circuits before closing the instrument. 20) Close chassis and secure with five Phillips screws, four on the bottom and one on the rear panel, and two silver flathead screws on the front edge. 21) Test and calibrate using the procedures described in the MIDIJACK Quick Installation Manual. 22) This installation can be completed in one hour. 23) When using MIDI for control of the analog synthesizer voice, the single and multiple note triggering modes supported by the MIDIJACK do not have any effect on the original Moog-style single note triggering on the Rogue. The MIDIJACK MIDI button will activate or deactivate MIDI operation, allowing full MIDI control of the analog VCOs, VCF, and envelope generator, but will not interfere with the local keyboard triggering of the envelope generator. It is impossible to bypass the keyboard completely so it is probably a good idea not to play the local Rogue keyboard while MIDI is in use or vice versa.